Who needs a car when you've got a piece of industrial equipment? Fast food drive-thru workers have seen it all. People pickup their orders while barefoot, shirtless and in oddball outfits all the time, but usually they're in their cars — not on the back of a piece of industrial equipment. 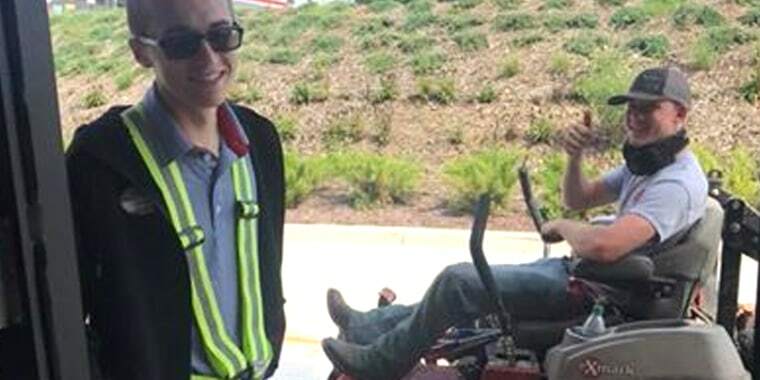 On Thursday, landscaper John Kirk stopped by a Chick-fil-A in Frederick, Maryland, to pick up lunch while driving on a heavy duty Lazer Z riding lawn mower. Now, photos of the unusual pick up are going viral on social media. "It's definitely not something that's happened before and we didn't expect it at all, but he showed up at the drive-thru, so we were happy to serve him," Chick-fil-A manager Erin Crumpler told TODAY Food. Kirk and all of the drive-thru employees had a laugh, according to Crumpler. Chick-fil-A employee Ethan Thomas came outside to serve Kirk his meal and his co-worker, Lauren Harshman, snapped some photos and posted them on Facebook. "When you're really craving that classic Chick-fil-A sandwich meal! ? Our Drive-Thru team is ready to serve you!" the Frederick, Maryland, location captioned the photos on Facebook. The photos caught the attention of local news stations, surprising Kirk and the Chick-fil-A employees. "Wow, I have been a landscaper for less than 24 hours and I'm already famous," wrote Kirk, who is a new employee of a local landscaping company called Hidden View Grounds Management. Thomas was also shocked by all of the attention. "Wow, I've been working at Chick-fil-A for a month and I'm on national news," Thomas wrote on Thursday. This isn't the first time that a customer has rolled up to a fast food drive-thru window with an odd mode of transportation. In May 2018, a man with a horse and buggy was served at a Taco Bell drive-thru in Litchfield, Illinois. Earlier in the year, in January, a woman on horseback picked up a Frosty at a Wendy's drive-thru in Fox Chapel, Pennsylvania. However, no horses have ever pulled up to the Chick-fil-A in Frederick, Maryland ... yet. Said Crumpler, "Usually it's just a car — the lawn mower threw us off."